Looking for quality motel accommodation in Gisborne? Well Pacific Harbour Motor Inn is the place to stay. Fully air-conditioned motel accommodation in a superb location. 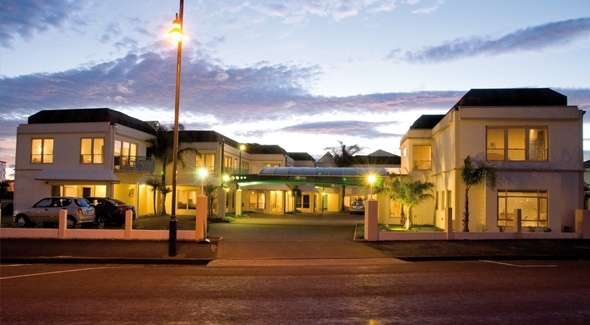 Pacific Harbour Motor Inn has long enjoyed its reputation as being the most sought-after motel accommodation in Gisborne. Corporates, business people, government officials and discerning visitors have always considered Pacific Harbour Motor Inn as their first choice when coming to the first city in the world to see the sun! Overlooking the palm-tree lined bank of the Turanganui River and the inner harbour marina, you are only a minute or two's walk from the wharfside restaurants, cafes and bars as well as the centre of town. The monument to the famous Captain Cook is only a short stroll away, near the harbour entrance and the beautiful sun-drenched Waikanae Beach. You can choose from a variety of units including corporate studios, one or two-bedroom units, access units or one of the spacious suites ideal for entertaining guests. For your comfort, all units are air-conditioned. It is often necessary to book well in advance at the Pacific Harbour Motor Inn so don't delay in making your booking to secure the dates you require.